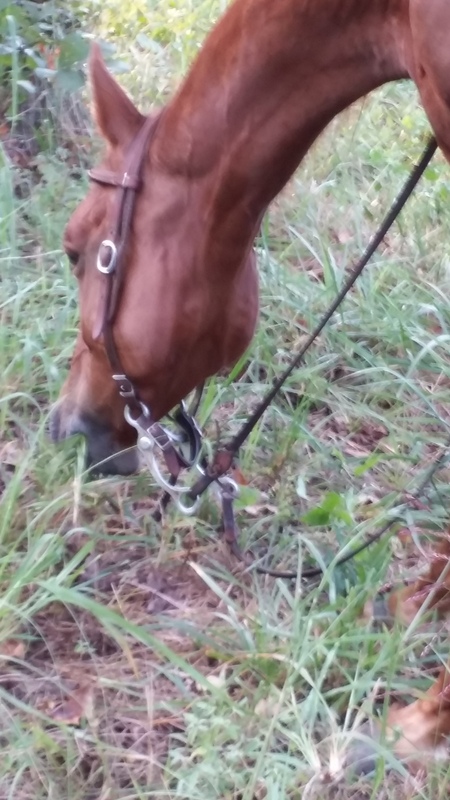 How do I graze my horse on the trail if I don’t have a halter? It’s a good question. Sooner or later, we all ride off leaving our halter still tied to the trailer. Sometimes we leave it deliberately, but others times on accident. Lunch time rolls around and you want to let your horse graze without having to chew with the bits in his mouth, so here you go. These are photos of Speck on a recent trail ride. The halter was tied to the trailer and Speck was hungary. It was nearly 6:30pm and he had been ridden most of the day. We stopped for a break and let him have a snack at the same time. We simply slipped the bits out of his mouth and then replaced the headstall back over his ears. The reins were loosely wrapped around the saddle horn and so he could move about without breaking them. Growing up riding, we rarely took a halter with us. Instead, we just slipped the headstall like shown in the photos. Keep in mind, you need to know your horse before you do this. With the wrong horse, you can find yourself hiking in boots and spurs!!! 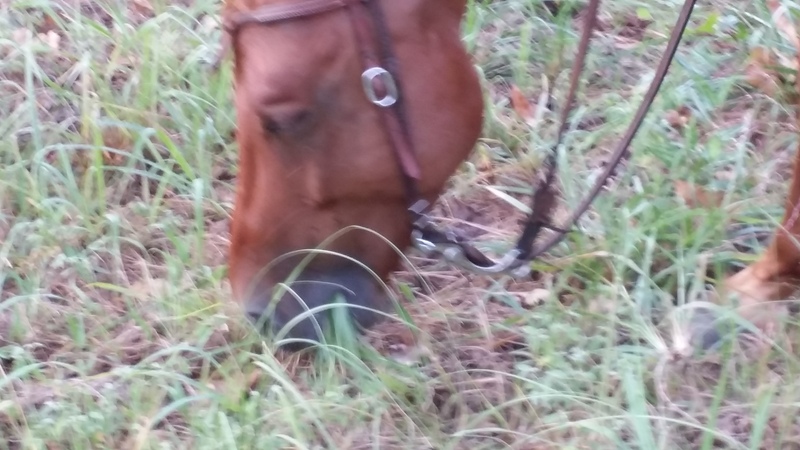 This entry was posted on Tuesday, September 16th, 2014 at 7:54 pm and is filed under Meet Speck, Rider Training, Trail Horse. You can follow any responses to this entry through the RSS 2.0 feed. You can leave a response, or trackback from your own site.